Luxury Shenandoah Valley Secluded River Cabin with all the amenties you need for “Rejuvenating Your Body and Soul. 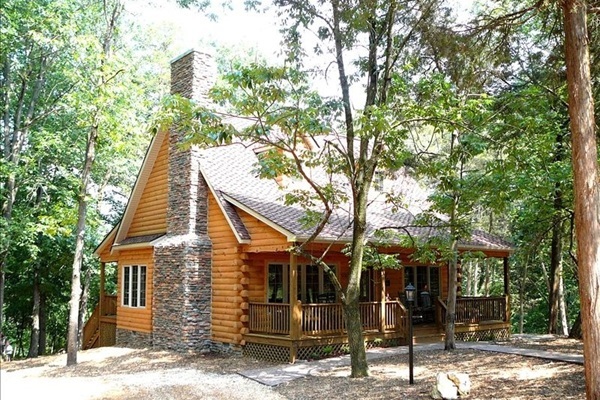 Nestled in the Blue Ridge Mountains this elegant yet warm and inviting log cabin was carefully custom hand-crafted with rough pine boards cut at the local saw mill located in Shenandoah, Virginia. All the care and attention was given to detail with guests in mind for providing all the comforts of home away from home. The cathederal ceilings will give you that romantic feel with the open floor plan and the warmth of the large stone gas fireplace. All of the interior decorating has been chosen with the natural surroundings of the outdoors right down to the designer quilts. The mastersuite offers its own private bathroom with a corner jacuzzi tub along with a step-in shower for complete privacy. All three bedrooms are equipped with 42” HD TV’s and DVD players and the Great Room with a 56” HD TV and DVD player. Rates are subject to change without notice. Pricing excludes taxes, processing fees, additional adult guests or pets and ADP Policy.